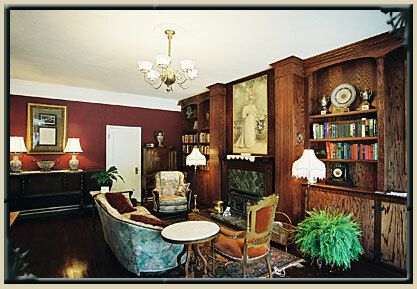 Enjoy a game of cards or a cup of fresh-brewed tea, chat with friends, or just curl up in front of the fire with a good book in the old-fashioned, quiet ambiance of our Victorian parlor and library. Teas, coffees, decafs and old-fashioned gingerbread cookies from Susie's Bakery are available 24 hours a day in the small lounge behind the parlor. Also, you can enjoy an assortment of old movies, or watch the news if you like. Ten dollars worth of Hotel Credits are issued at check-in for each day of your stay. These are good at most of the restaurants on this end of town, all within easy walking distance of the hotel. They can be used for any meal and can also be used in our Emporium where they spend like $5 bills. WiFi? Yes. Like to work out when you travel? Our guests enjoy gym privileges across the street at the White Wolf Gym.We are always happy to share information about local conditions and events, etc. Just ask. Check-in is between 2pm and 6pm and check-out is at 11am unless otherwise arranged. Sorry, no smoking in the building, but there are comfortable old-fashioned swings and rocking chairs along the side of the building where guests are welcome to smoke if they wish. The hotel is a retreat for many of our guests from their hectic everyday lives, including, as much as they love them, their children. There are many retired couples, honeymooners, people celebrating anniversaries and birthdays, etc. Because of this, we have opted not to permit children under 12. Sorry, kids. We hope to see you when you are older though. For people traveling with pets, we can recommend a couple of excellent boarding facilities in the area, but do call at least three weeks in advance.